US value airlines have grown their combined position in the market to nearly 12%. Alaska, through its acquisition of and merger with Virgin America, and JetBlue, through organic growth after opting out of the bidding contest for Virgin America. Those operators have made some network tweaks during the past year in order to leverage their respective strengths and improve revenue performance. Alaska has made adjustments in certain California markets and JetBlue has placed less emphasis on its focus city in Long Beach, increasing its presence in the US transcontinental market. Southwest, which is the market share leader in the US and still the country’s largest lower cost carrier, is focusing much of its network attention in 2019 on the long-awaited launch of services to Hawaii, which will pressure Alaska and other airlines operating in the market. But Hawaii is a logical extension for Southwest, which is launching service from California airports where it has a strong position. Alaska makes network tweaks and plans lower capacity growth, changes which are showing signs of improving its unit revenues. JetBlue’s network shifts include trimming Long Beach and redeploying capacity to Fort Lauderdale, Boston and transcontinental markets. Southwest’s entry into the Hawaii market will intensify already weak pricing trends on routes from the mainland to Hawaii. 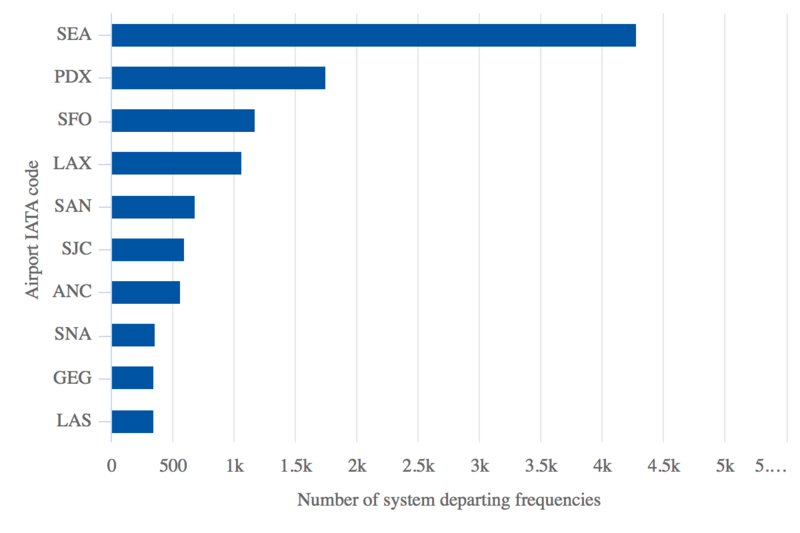 Although Southwest and the three large US global network airlines dominate the country’s domestic traffic, Alaska and JetBlue are the fifth and sixth largest airlines measured by traffic share. Alaska’s 2016 purchase of Virgin America and subsequent merger with its smaller rival helped push its share price past that of JetBlue; however, even as Alaska decided to buy Virgin America in part to increase its profile in California, and expanded rapidly on routes on Virgin America’s San Francisco base, it has opted to eliminate some routes from California. During 2017 and throughout a portion of 2018 Alaska fought revenue weakness, and ultimately decided to trim some flights from San Francisco, which is the company’s third largest base measured by departing frequencies, as of late Feb-2019. Alaska cut services from San Francisco to Minneapolis, Mexico City, Cancún, Denver and Fort Lauderdale. It has also eliminated flights from Los Angeles to Cancún, Havana and Orlando and from San Diego to Mexico City. Those cuts are largely typical in the ebb and flow of network planning, particularly during a merger integration. The route adjustments, along with strong close-in demand and solid business volumes, resulted in Alaska posting a 5.2% rise in unit revenue year-on-year in 4Q2018. The company is planning much slower growth in 2019, and while its revenue momentum will slow in 1Q2019, Alaska expects its positive revenue trends to continue. After years of high capacity growth, Alaska is capping its capacity increase at just 2% in 2019. Data from CAPA and OAG show that Alaska’s ASKs increased by 11% in 2016, 9% in 2017 and 7% in 2018. Alaska’s moves show that even with a higher overall market share, competition remains robust in the US market, and airlines of all sizes constantly need to evaluate the profitability of routes within their respective networks. JetBlue has also made network shifts during the past year, opting to shrink at its Long Beach focus city after local community activists succeeded in blocking the airline from launching international flights from the airport. 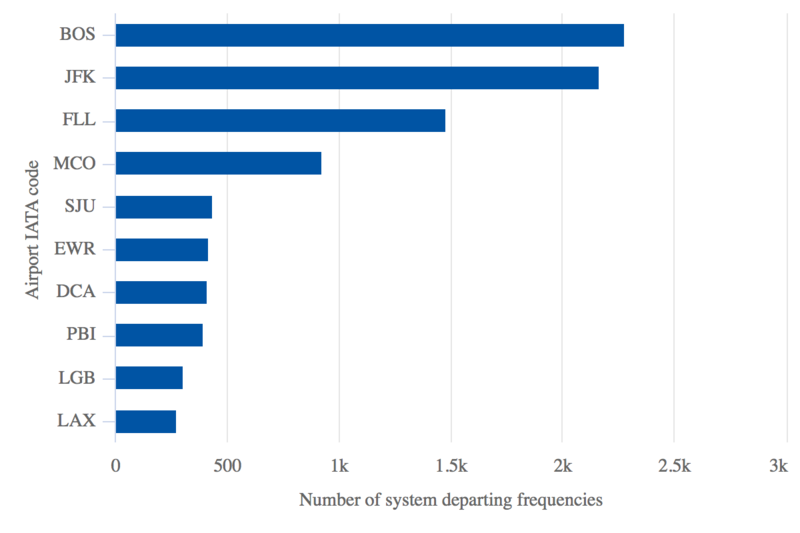 As a result, JetBlue cut its daily flights at Long Beach from 35 to 23, and as of late Feb-2019 the airport was the airline’s ninth largest base measured by weekly departing frequencies. As it has pulled back in Long Beach, JetBlue has redeployed that capacity on other routes, including new service from Ontario, Burbank and Long Beach, California to New York JFK, and from Salt Lake City to JFK. 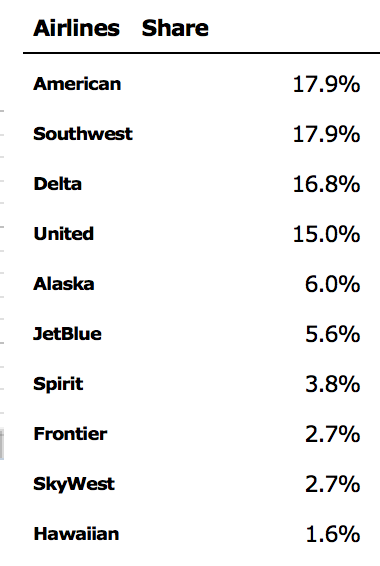 Overall, the airline has continued to grow its Fort Lauderdale and Boston focus cities, where it holds ASK shares of 22% and 27%, respectively (as of late Feb-2019). During 4Q2018 JetBlue’s unit revenue growth in Fort Lauderdale outpaced its system average for the seventh consecutive quarter. JetBlue recently outlined plans to bolster frequencies from Boston to 12 markets, including nearly hourly service to Washington National airport and the three New York area airports (JFK, LaGuardia and Newark). The push is part of JetBlue’s march to reach a stated goal of 200 daily departures in Boston and occurs as the US full service carrier Delta has identified Boston as a focus city, having declared plans to reach 140 daily departures in Boston. During 2018 JetBlue did cite some unit revenue pressure on Boston leisure routes “tied to growth from a legacy airline”, but concluded that those trends were improving sequentially and stressed that, given Boston’s geographic location, it was made for an airline that specialises in point-to-point service. The big headline for Southwest’s network development in 2019 is the airline’s launch to Hawaii. It has outlined plans to serve Honolulu, Maui, Kona and Lihue from Oakland, from the California cities of Oakland, Sacramento, San Diego and San Jose as well as some inter-island service. The airline has not offered a specific schedule, but it has leading positions in all those California airports; it hold the majority ASK share in all of those airports, which means it can tap an existing passenger base, and up the stakes in an already competitive market – California to Hawaii. There is no doubt that Southwest’s market entry in Hawaii will already deepen existing pricing pressure on routes from the US west coast to Hawaii. Hawaiian Airlines has said that competitive capacity increased 11% on its North American routes in 2018, and company executives have stated that there was a strongly competitive pricing environment in those markets. Alaska Air Group has also stated that its yields in Hawaiian markets fell year-on-year in 4Q2018. Both Alaska and Hawaiian are at various phases of deploying a basic economy fare, which could prove competitive as Southwest enters the market; however, there is little doubt that sluggish pricing will linger once Southwest officially launches its flights to Hawaii. The moves by Alaska and JetBlue show that network development and route management is a living science, and a certain level of nimbleness is necessary to drive desired returns. Southwest is branching out into new territory in 2019 with its flights to Hawaii, and the time it takes the airline to recoup its investment will be a closely watched metric as those routes mature.